It is very apparent nowadays that most phone users spent unhealthy amounts of time on their phones. 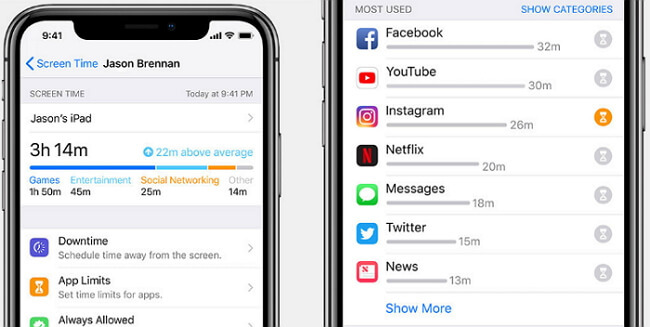 That is why Apple has come up with the Screen Time feature to help you put screen time parental control iOS 12 to manage the usage of your devices. Parents can also use this app to set screen time parental control on their children’s devices to keep a healthy balance between their schoolwork and their phone. In this article, we give you information on how to use the different Screen Time features to set limits on your phones. 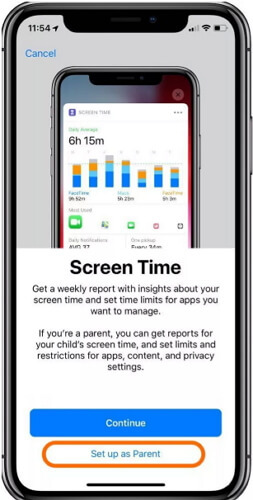 Screen Time is an Apple app that gives iPhone and iPad users a better understanding of the time they spend on their phones and what they need to do if it is excessive. Screen Time will present you with a charted explanation of your phone usage and give you ways on how you can set limits to your apps usage. Parents can use this app to put screen time parental control on their children’s iPhone or iPad to help in managing their phone usage. Step 1: On your iPhone go to Settings and click on the Screen Time feature. Step 2: Click on the Turn on Screen Time feature. Step 3: Two options will be displayed that you need to choose from. Choose the feature as a parent or a normal user. Step 4: Then click on Continue. You need to set a Screen Time passcode if you do not want other people using your Screen Time and making changes to your Screen Time settings. This is how you set a Screen Time passcode. Step 1: Click on Screen Time passcode. Step 2: Then enter a new passcode and click Confirm. You have now set up your Screen Time. Step 1: On your iPhone open Screen Time, click on App limits, and enter your passcode. Step 2: Click on the Add limit tab. Step 3: Choose the app categories that you want to set limits on like entertainment, social networking, games etc. then click Add. Step 4: Set the time limit for the app categories you selected. Note that you will get a ‘Time limit reached’ alert notice every day at midnight notifying you of the App limits reset. You can ignore it by clicking Ignore limit tab. Step 1: On your iPhone Settings go to Screen Time. Step 2: Scroll down to Downtime and enter your Screen Time passcode and Turn on downtime switch. Step 3: Click Start to set the time then click End to set the time limit. Step 4: Your Home screen will then get dimmer and only the approved apps will appear when downtime is working. A ‘Time limit reached’ alert message will appear if you try to open any other app apart from the approved ones. Step 5: To ignore it click on ‘Ignore limit’ then enter your Screen Time passcode. Click on the Green plus button to add allowed apps and the Red button to delete apps then select Always and enter your passcode. Step 6: Your Home screen will brighten as normal meaning you have finished setting up your downtime. You will receive a detailed weekly report of how you have used your iPhone or iPad in the last seven days. A popup summary will show you how you have used your device on a daily basis comparing it to the previous week if it has gone up or down. You also receive the average number of daily notifications you received. Screen Time uses bar chart color-coded to show you your daily app usage on the most used apps and an Insight section on useful observations. From the summary report you get to see the length of your longest session, the daily usage graph, after bed device usage time which can be a problem. You also get information on the apps that are sending the most notifications and causing the most pickups. With this information you are in a better position of knowing how you are using every app on your device and if it is necessary to put screen time parental control in iOS 12 on specific apps. 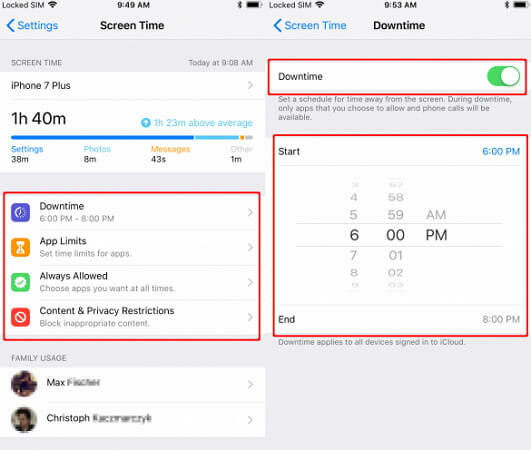 Step 1: On your iPhone go to Settings and open Screen Time. Step 2: Select the Content & privacy restrictions tab and enter your Screen Time passcode. Step 3: Turn on the Content & privacy switch. 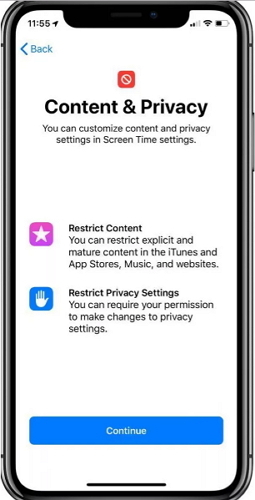 Step 4: Once you are done you can now put screen time parental control iOS 12 on almost everything like on iTunes purchases, app purchases, apps volume limit, apps explicit language, do not disturb etc. Smartphones are becoming too addictive to the point of concerned parents wanting to monitor and put screen time parental control on their children’s devices. With the different features available, you can now effectively put screen time parental control iOS 12 to manage your iPhone or iPad usage in a healthier way.